The North Central Regional Catchment Strategy (2003-2007) is available for download on the North Central Catchment Management Authority website (external link). Irrigation activities in the north of the catchment have resulted in increased salinity levels in the Murray River, due to the export of salt to the river. Much of the intensive agricultural land management has resulted in increased nutrients in rivers and tree decline through water logging, salinisation and insect attack (the former DNRE, 1997). The Loddon catchment is the most severely deteriorated of the four North Central sub-catchments and has the highest incidence of algal blooms in Victoria. Water quality in the upper catchment is good but declines in the lower catchment. Bendigo Creek, which takes drainage from Bendigo, has had a significant impact on the quality of water in Kow Swamp (NCCALPB, 1997). Significant land degradation potential exists in the region and requires careful management. The north western parts of the region are particularly susceptible to wind erosion and many areas in the southern parts of the region are susceptible to water erosion. Flooding within the North Central region is most likely to occur in the lower Loddon and Avoca River areas. 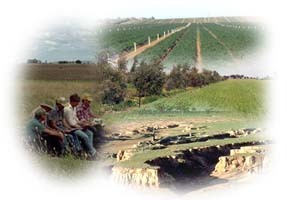 The North Central region has an extensive network of community groups (such as Landcare Groups) working in natural resource management. These groups have an 'on-ground' focus and are the major means by which regional catchment strategies will be implemented. There are a number of Catchment Plans and Salinity Management Plans that have been prepared for the North Central region. There are also a number of Declared Water Supply Catchments in the region that relate to proclaimed water supply. A full text downloadable version of the former Land Conservation Council's Final Recommendations for the North Central Area (February 1981) is available on the Victorian Environmental Assessment Council website. These provide an ongoing framework for public use of land in the area. Recommendations in the text have been edited to reflect government variations and amendments at the time of approval, and subsequent changes. The recommendations are grouped under major headings, such as Parks, Reference Areas, Wildlife, Historic Areas, Bushland Reserves and so on. Key recommendations are for Kara Kara State Park, Kooyoora/Melville Caves State Park, Kamarooka State Park and Whipstick State Park. The Victorian Landcare and Catchment Management Magazine online site of DSE (external link) provides copies of all these magazines dating back to 1996.